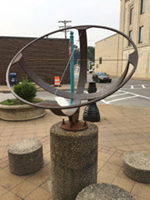 This is a large horizontal dial 10 feet in diameter, constructed of marble with a steel gnomon. The sundial was donated in honor of Courtney Leigh Clayton and is open to the public as part of the beautiful Discovery Garden. 37.2 ft x 23.8 ft. This is probably the world's largest analemmatic, unusually designed to show standard time directly. 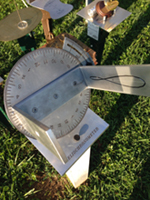 It took 8 years of daily readings to perfect the sundial, which is accurate to within 2 minutes. Hour markers are bronze Roman numerals. Minute lines inscribed in limestone curbing. 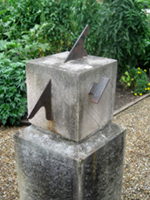 The gnomon itself is a moveable pole that is set on an AM or PM daily curve. NASS member P. Kenneth Seidelman was instrumental in correcting this design in 1978. Dating from 1976, this "secret" garden room (once a sundial garden with boxwood parterre) was designed by Thomas Church and is on the western side of the 1908 Square Fountain pool. The ground level horizontal dial is limestone with an iron gnomon. Hour lines identified by Roman numerals; hours divided into minutes. Hour line distribution adjusted for style width. EoT engraved on PM side of dial face. 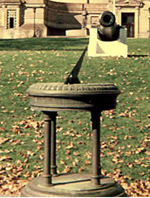 Dial sits atop a large mortared stone base. A 32x64-inch cast stone vertical declining dial located 25 feet up a vertical column at the school's entrance. An EOT plaque is located below the dial. A concrete and engraved brick analemmatic dial set in a garden of crushed rock. 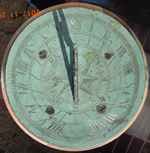 A bronze armillary dial with meridian and equatorial rings and Arctic and Antarctic circles on a stone pedestal.